The Bolete genus (and those closely related) are some of the largest and most exciting mushrooms to be found out there. From a culinary point of view there are several that are more than worth the their place in the kitchen, but there is one in particular that stands out as ‘best of the rest’. So let’s get it’s name sorted out. Most people will definitely recognise common/local names, a couple of which are not English in origin. Our common tongue has described this as the ‘Penny Bun’ for obvious reasons (although probably not to todays generation), many also know it as the Cep (French) but then most cooks and chefs will often know it from it’s Italian translation as the ‘Porcini mushroom’. But at the end of the day, science has kept things in order, strictly labeling it as Boletus edulis – the latin name ‘edulis’ simply meaning ‘edible’. Very apt, as usual. Excluding Truffles, the Cep (as I’ll call it from now on) is one of the most highly prized edible finds, especially in mainland Europe. 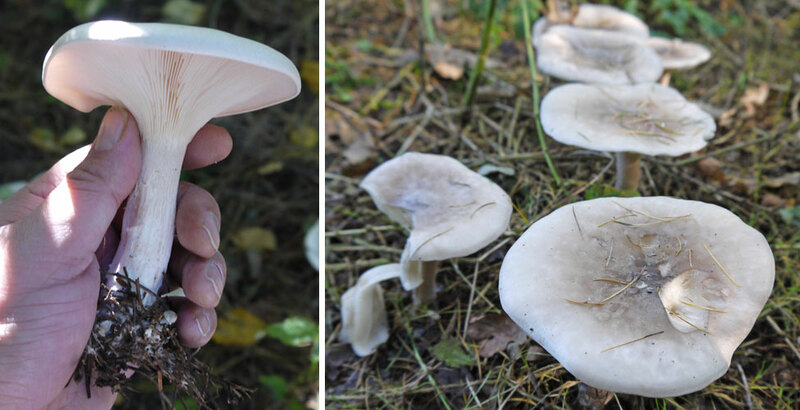 Some foragers only have this one mushroom on their list, such is their passion for it. 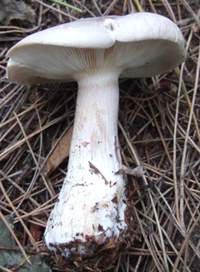 It is a very distinctive looking mushroom with it’s stout, chunky stem and small ‘out of proportion’ cap (common to younger examples – shown opposite). They can sometimes pop up in abundance or smaller groups, but are often solitary near/under broad-leaved and coniferous trees. The picking season can be as early as June or July, but often show up from August to September. With this year’s season being mostly dry, only November has been reliable in dishing out the goods – for me this year anyway! Young specimens are usually favoured over older specimens (often maggot-ridden) and will be cooked or pickled whole, or even dried for later consumption. They freeze extremely well too. The pores in older ‘middle-aged’ specimens change from white to a dull yellow-green colour (as the spores are olive green/brown). The tubes are usually removed and the cap is thinly sliced along with the stem (peeled first) to add to the pan. Overall, it’s good to know there are many ways to store, cook and eat this mushroom. I’m no top chef , but there’s lots of ideas out there. A great selection of recipes with the cep mushroom can be found on the BBC website here. There are a couple of edible ‘look-a-likes’ often confused with the Cep, such as the The Dark Cep (Boletus aereus) and maybe the Bay Bolete (Boletus badius). But beware the Bitter Bolete (Tylopilus felleus) with a dark network on its stem. Although not posionous, it’s a recipe for disaster when served up at dinner time. As the name suggests it has a very bitter, unpleasant taste. So a useful feature to note in identifying the Cep is looking for the raised ‘white’ network/pattern on the stem (reticulation) as shown in the picture below. None of those mentioned above share this feature. What a difference! A large middle aged/mature specimen next to a younger example. Notice the ‘white’ raised network on the stem and how the pores age ‘yellow/green’ compared to the paler white colour of younger ones. A young, perfectly from Cep mushroom discovered in Leicestershire UK – open grassland near woodland. 8-25cm across. Brown. White line at margin of cap. Smooth and dry becoming greasy. Viscid in wet weather. Flesh is white (flushed dingy yellow or vinaceous in the cap). 3-23cm x 3-8cm. Often swollen at base. Pale with white network covering the stem. Pores are small and round, initially white; ageing yellow, then greenish-yellow. Tubes are white, becoming grey-yellow. Spore Print: Olivaceous walnut-brown (see how to take a spore print here). In coniferous, broadleaved or mixed woods. Summer – late autumn. • Have pores (open ends of tubes) on the underside instead of gills. Easily separated from the cap. • Most have dry caps (viscid when wet – but not glutinous like Suillus genus). • Most have reticulation on the stem; a fine network covering parts or all of the stem. Make note of the colour. • When cut or bruised take note of any changes in colour to the flesh or pores. There’s a extremely good chance of you finding a large group of Sulphur Tuft (Hypholoma fasiculare) at just about anytime of the year (especially from April to December). These beauties are extremely common in the UK and populate all types of woods and forests. They are Saprotrophs (feeding off decaying matter) and appear in small tufts or large groups on dead/rotting wood (deciduous or coniferous), tree stumps or underground buried decaying wood or roots. 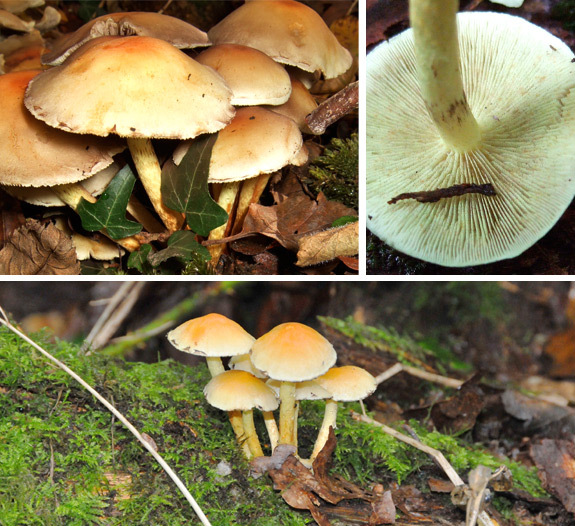 The Hypholoma group of fungi like these are commonly known as ‘Brownie’. When found in great numbers they are indeed a great sight to behold. When in their prime, the convex cap has an amazing bright sulphur-yellow colour with darker orange tones towards the centre. Remnants of the pale yellow veil (initially covering the gills) can be found at the edge (margin). The stem, which is often curved, share a similar yellow-brown colour (sometimes greenish) though dirty brown towards the base with a fibrous appearance. The gills , when younger, appear green-yellow which act as a good indicator in identification. They almost look good enough to eat (and do have that ‘mushroomy’ smell), but unfortunately are not edible and will most likely give you stomach ache, vomiting and similar gastrointestinal symptoms. But the almost identical Conifer Tuft (Hypholoma capnodes) on the other hand – is edible – but less common throughout the year. As the name suggests, this species only grows in coniferous woods, in fact only always found on rotting tree stumps. There is a ‘taste test’ you can make to identify between the two. Simply taste a small sample from the cap, making sure you don’t swallow! If it is bitter in taste, it is a Sulphur Tuft but if it is mild, then it is a Conifer Tuft. Please note that you shouldn’t try this taste test with other mushrooms or toadstools you find (unless you know exactly what you’re dealing with. ie. Russula or Lactarius) as nasty results can come from tasting unknown species! And if you do find some Conifer Tuft, I’ve heard they’re best steamed or used in a soup. I have no idea what they taste like! Sulphur Tuft (Hypholoma fasiculare). Note the slight yellow green of the gills which age to an olive colour, and then finally to dark brown. 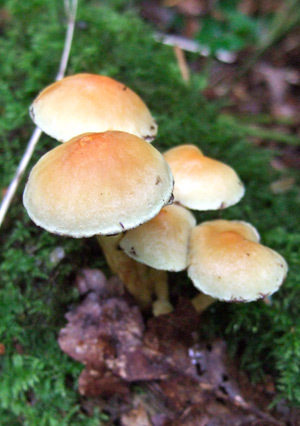 Sulphur Tuft – Grouped clusters on a fallen log and a group of young/small specimens. • Often yellow/orangy brown caps. • Dark brown spore print. Well – it’s been the driest spring we’ve had since records began! That probably explains why I haven’t had much luck in finding some good edible spring mushrooms up for offer! 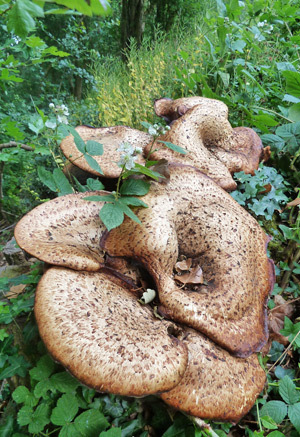 But I did stumble across some large edible beauties today – unfortunately I found them too late. They were past their prime and had dried out quite a bit due to old age and the dry weather. Curses! Even in this condition, they were still good examples of Dryads Saddle (Cerioporus squamosus / Polyporus squamosus) – a polypore mushroom which can grow quite large indeed as you can see from the photos. All polypores (bracket fungus growing on trees) have ‘pores’ instead of gills where the spores disperse from. This species is a parasite (and/or Saprotroph which feeds off decaying matter) on deciduous trees such as elm, beech and sycamore causing severe ‘white rot’. They burst into life in late spring/early summer and can be found on stumps as well as living trees (often 10-15ft up the trunk) growing in layered clusters (sometimes singularly). Although edible, only young specimens are worth taking as the texture and taste of the older flesh is unappetising. 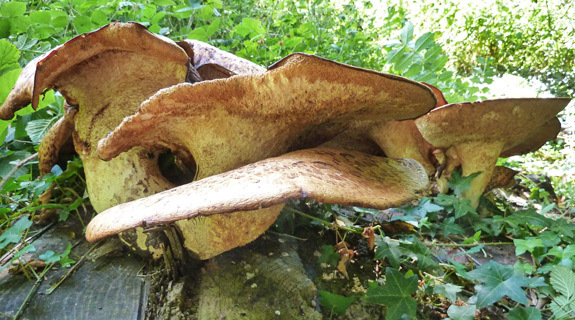 (See a great simple Dryads Saddle recipe here. Apart from it’s large dimensions (cap up to 60cm across and stem up to 7cm) other identifiable characteristics are the brown scales which are spread in a semicircular pattern across the ochre-yellow cap, the flesh of which is relatively thin. As shown in these pictures, once past it’s prime, the mushroom soon deteriorates, becoming very dry (especially helped along by this hot weather!) and infested with insects! But nevertheless they are a great site to behold when in a large group like this. There are many old folklore stories behind mushrooms describing how they acquired their common names (sometimes several stories from several countries), and this one does not disappoint in originality. The ‘Saddle’ element derives from the shape of the cap which can sometimes resemble a horses saddle. The word Dryad means ‘Tree nymph’ in Greek mythology. I find myself imagining what the Dryads horse looks like! Drying up! Once past their prime, These polypores soon dry up and waste away. How the mighty have fallen! In contrast to these older specimens, take a look at this very young specimen I found only a few weeks later. This little beauty is only 2 inches long. I left it to grow and I’m guessing it won’t grow that large anyway due to the fact there were older, dying fruit bodies near by – around 4-6 inches in size.